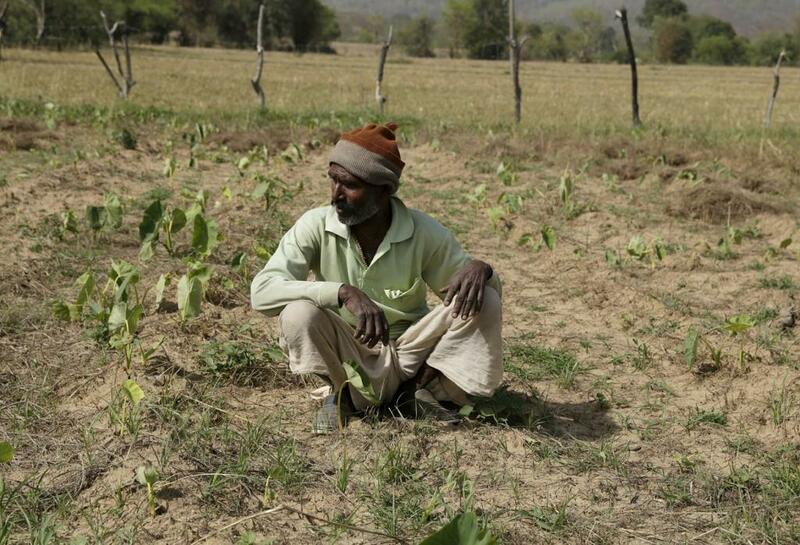 The Economic Survey 2018 clearly says that long-term weather patterns implies that climate change could reduce annual agricultural incomes in the range of 15 per cent to 18 per cent on average, and up to 20 per cent to 25 per cent for unirrigated areas in India. This brings the focus on existing relief and compensation mechanism to deal with crop losses in India. Studies have shown that existing relief and compensation mechanism for farmers against crop loss is ad hoc, chaotic and politicised and has failed to bring timely and adequate help to affected farmers. Therefore, expectations from recently launched flagship crop insurance scheme increased, to provide timely and adequate compensation to affected farmers. 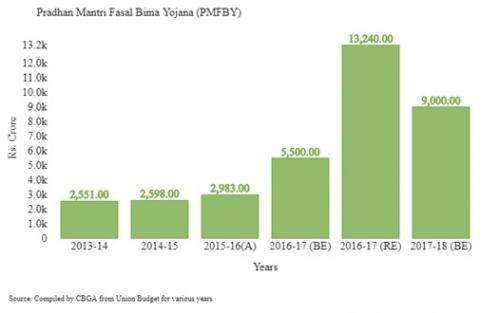 Pradhan Mantri Fasal Bima Yojana (PMFBY) came into operation from April 2016. Coverage of this scheme in Kharif, 2016 was as following - Gross Premium collected was Rs 16476.06 crore, total claims were Rs 9582.33 crore, and number of farmers benefitted was 99,13,133. During Rabi 2016-17, gross premium collection was Rs 5527.69 crore, total claims was Rs 3709.72crore and number of benefitted farmers were 16,93,156. Centre made provision of Rs 5,500 crore for PMFBY for 2016–17. Further, it planned to bring 40 per cent of agricultural area under PMFBY in 2017–18 and, accordingly, a provision of Rs 9,000.75 crore was made in Budget 2017–18. Later on, additional allocation of Rs 1,701 crore was made through supplementary demands, taking the total allocation to Rs 10,701 crore, as per the news reports. Previous year’s budget estimations to crop insurance schemes in India can be seen from figure 1. Will increasing PMFBY coverage help farmers? Crop insurance coverage has increased in recent years. Government has further targeted at increasing the coverage. In Budget 2018-19, allocation to the PMFBY scheme is Rs 13,000 crore and a target of increasing coverage to 98 million ha gross crop area has been set. However, merely increasing the budget allocation for PMFBY scheme might not help the farmers. Implementation of this scheme is facing challenges and raises some serious concerns. There have been farmers’ protests in various states against compulsory coverage of loanee farmers under this scheme. Some farmer activists have, in fact, approached court to dismantle this scheme. Farmer activists fear that this scheme might end up benefitting insurance companies more than the farmers. To make this scheme really attractive for farmers, various serious measures need to be taken. Currently insurance unit is at village level. This is the single biggest factor that demotivates farmers to apply for this scheme, results in small coverage of non-loanee farmers. Crop insurance coverage in India has increased in recent years mainly because of compulsory crop insurance provisions for loanee farmers, who have taken institutional farm loans through Kisan Credit Cards. Keeping insurance unit at village level means, insured farmers even with 100 per cent crop loss might not be eligible to get any claim at all, if there is no loss in sample farms selected for crop cutting experiments. In an entire village panchayat, random sample from only four farms are taken, which determine, if any farmers of that village panchayat will get any claim. Hence, this scheme does not guarantee relief for individual farmer in the event of crop loss. Bringing insurance unit at individual farm level is a major technological challenge, which should be addressed at the earliest. Issue of moral hazards remains at different levels of implementing PMFBY. Sources from insurance sector say that risk of moral hazard increases manifold if the insurance provider is a private company, as it is under pressure to focus more on increasing profit unlike the public sector companies. Some of the issues that have become evident, include ghost farmers, manipulation of crop cutting experiment data at village/district level to show minimum crop losses, collecting more insurance premium in low-risk areas through informal middle men from banks, not entertaining or wrongly rejecting claim applications of eligible farmers under individual cases like localised calamities, and a non-effective grievance redressal mechanism for farmers. Even some state agriculture department officials have shown displeasure regarding the failure of insurance companies in fulfilling PMFBY operational guideline requirements. Further, there are instances where claims were provided to farmers because of political reasons. Insurance company officials, on the condition of anonymity, say that they were made to provide claims to farmers in recent years because of political reasons in certain areas despite no crop losses. There has been significant delay in claim payment to farmers even for Kharif 2016 and Rabi 2016-17. There should be strict compliance of timelines with regard to the process of claim settlement to provide adequate and timely compensation to farmers. A limited number of crops are notified by states under PMFBY. Only these crops can avail of insurance. This can act as an impediment to crop diversification. PMFBY will have to make insurance relevant to farmers by including more and more crops under notification and by allowing insurance for mixed cropping. The grievance redressal system to address farmers’ complaints is either non-existent or too complicated. Dedicated common toll-free numbers should be channelised to address all queries, concerns and grievances of farmers with respect to crop insurance. This toll-free number should serve as a one-stop solution for crop insurance. Farmers should be able to avail of a single window that is accountable to them for all aspects of the scheme. CAG report, titled “Report of the Comptroller and Auditor General of India on Performance Audit of Agriculture Crop Insurance Schemes - Union Government (Civil), Ministry of Agriculture and Farmers’ Welfare, Report No. 7 of 2017, (Performance Audit)” released in July 2017, had raised serious concerns on the way crop insurance schemes are being implemented in India. This report says that despite provision of large amount of funds under the schemes by government to private insurance companies, there was no provision for audit by the Comptroller and Auditor General of India. Sources on the condition of anonymity say that private companies are not properly monitored and premium subsidy is released to them simply on the basis of affidavits provided by these companies without checking actual situation on the ground. Report has raised serious questions on whether insurance claims actually reach beneficiary farmers. It says that since implementing agencies did not ensure submission of Utilisation Certificates by Bank/Financial institutions, even the minimum assurance that claims had been distributed to beneficiary farmers is lacking. The report noted that agriculture insurance companies failed to exercise due diligence in verification of claims by private insurance companies before releasing funds to them. Report says that central and state governments have no provisions for maintain databases of insured farmers despite substantial financial contribution made in the form of premium subsidy and claim liability. Consequently, government is dependent on information furnished by loan disbursing branches of bank and insurance companies. CAG found various issues like delays in issue of notifications, receipt of declaration from Bank within cut-off dates, delays in receipt of yield data from state governments, delay in processing of claims by implementing agencies and irregularities in disbursement of claims by banks to farmers’ accounts. Unless these serious issues are addressed adequately, doubts will remain about the scheme’s utility for the farmers. Farmer activists’ allegations that this scheme will benefit insurance companies more than the farmers may come true.